Do you need to get into shape with the next 30 days? Are you up for a 30 day challenge? Can you exercise 25-30 minutes per day five days a week over 30 days? Do you have a skipping rope, space and a timing device? Are you in need of weight loss, fat loss and an increase to your fitness levels? Are you in need with help with your food and nutrition? Is your mind and body worth £1.56 per day? 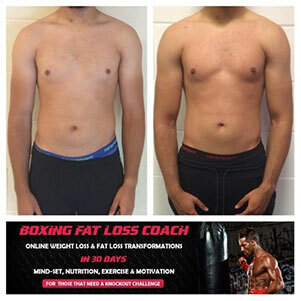 The Boxing fat loss coach 30 day online HIIT challenge is a progressive and simple to follow online fitness challenge, that will not only get you into shape, but also improve upon your fitness from the comfort of your own home, or if you are a gym member you can do it from the gym. Once you have signed up, you are sent an electronic questionnaire that you have to complete, that will help me to help you, but not only that, it will give me a great understanding of you, also you are sent information and tasks you will need to do before you start the boxing fat loss coach 30 day challenge, like how to measure yourself and how to do the fitness test. Once this is done you are given specific nutritional information that is personal to you and will help you make better choices than what you currently make, once this is done you are added into a secret and closed face-book group of which the fun begins and which you will find your daily workouts, your nutritional tips, and other things that will really motivate you towards your fitness and exercise success, it’s very simple to follow and it don’t matter if you have ever boxed before as it is based around circuits, but it’s how the whole 30 days are put together and how you will see how your fitness and body shape will change in 30 days. Each day gets slightly progressive and harder, with a few days of active rest, and you will feel how you are getting fitter and more energetic, and how you getting challenged, by doing simple exercises. It don’t matter if you have never boxed before this is not about boxing this is about getting the exercises and tasks done and making yourself accountable so you can get the desired results that you are working towards, but also its about you doing the daily Boxing fat loss coach 30 day challenge with motivated others who desire results just like you. Does it matter how fit you are? As long as you can jog for two minutes on the spot, you can do this, by all means if you have not exercised for a number of years, it might not be for you. Would I have needed to have boxed before? 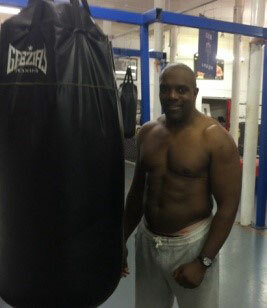 As the workouts are very much circuit based, you would not have needed to have boxed before at all, in fact most of the people that have done it before, have never laced up a boxing glove and neither will you, so it is for non-boxers. Will I follow a strict nutritional plan? Although you are encouraged to follow certain guidelines that will give you results, we have people that have the occasional treat while doing the Boxing fat loss coach 30 challenge, and still get great results, you are encouraged to eat wholesome foods than normal, and you are also given a breakdown of the macro-nutrients you need to be eating and ratio’s of them. But it’s as simple as this the better you are willing to eat the better, is more than likely the better result you will get. Special populations with specific eating needs can also be catered for. All the daily workout’s come with videos, and if need be alternatives are given for those that have injuries and have limiting factors, so it’s very to follow and full instruction and order is given. What time of the day I am I expected to do the 30 minute workout? It’s about getting the 30 minute daily workout done, regardless of the time of day, just get it done, research may tell us the best time to exercise for maximum fat loss, but I just need you to get the 30 minute Boxing fat loss workout done on a daily basis. What happens if I miss one of the daily workouts? Well first let’s plan on not missing a daily session because this can lead into a spiral of dropout. Before you start the Boxing fat loss 30 day challenge I would advise you to pencil in, your daily workout times, so too make sure that you are setting yourself up to make sure that this gets done daily, but I know how life can be, and things like work and family life pressures can get in the way, but all I ask before you sign up, what is your real purpose and motivation for doing this. So if you sign up try and get the daily workouts scheduled and done daily. 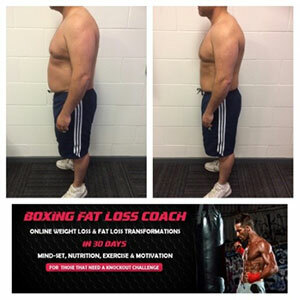 How much weight am I expected to lose doing the Boxing fat loss coach challenge? This really depends on how much weight you have to lose, if you have a lot of weight to lose, you will lose a lot of weight and drop a lot of inches, if you are very lean in the first place you will reduce your body fat and not necessarily not much scale weight, and other factors come into how much weight reduction you will get doing the boxing fat loss 30 day HITT challenge, one thing I do know you will you will definitely not finish the way how you started both how you look and also how fit you will have become. Can I still do if I am a member of a gym? You can certainly do other activities while you are the 30 day challenge, I would certainly encourage this if you desire, just as long as you get the daily workouts done and you are not over doing it. What happens when the 30 days are over? After the first 30 days stage 1, you have the option of doing stage 2 which is very much gym based and is resistance and strength and conditioning based, and will allow you to get stronger and also will increase your strength and stamina also fitness. You have the option of doing stage one again to maintain what you have achieved in the previous 30 days. 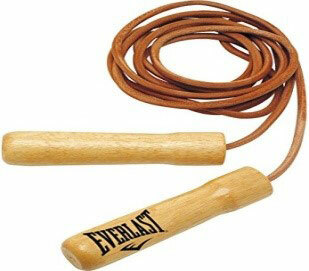 All you need is space, a skipping rope and a timing device, and a mat which is optional. Must I be a Facebook user? No not really, but it would be easier, but I also have an alternative, for those who don’t have a face-book account. How much is it to do the 30 days boxing fat loss coach challenge? It is £47 for the month which works out at £1.56p per day. Are you up for results and are ready to go, are you fed up of the weight, the lack of fitness, do you need a challenge? Do you want better mindset and nutritional habits over the next 30 days? Do the next boxing fat loss coach 30 day online HIIT challenge and give your mind and body the punch it needs over 30 days. 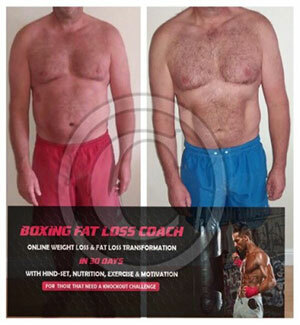 Get in touch and let’s get you sighed up to the next Boxing fat loss coach 30 day online HITT challenge. Remember stage 1 is about getting you losing weight, body fat, inches, increasing of fitness levels, and mentally creating daily health and nutritional habits. Either sign up straight away or email administration on to know the next up and coming dates and how you can increase your leanness.